The person running the site is named Egon Skovmose, and is very friendly to work with. His phone number is (403)948-4644; fax 948-4643. The culture envelopes are sized for 130 gallons of milk at a time, so I keep the opened portion in a small jar in the freezer, and just use a pinch at a time. After our goats dried up last winter, we were using purchased raw cow’s milk for yogurt, which I’ve learned is tricky to make into yogurt without curdling. We now have spring “kids” and I’ll be back into cheese making in a few weeks. Hooray for fresh grass! Our regular routine is to add the culture to the warm from the goat milk, and put it immediately into the incubator for 24 hours culture. 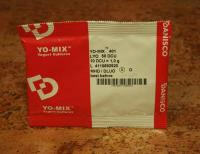 I forgot to add that the yogurt culture that I like is the Yo-Mix 401. Store yogurt also works for a starter, but all the ones I’ve tried have turned out to be very sour. We learned of this source from Grace Harbor Farms dairy—I was using their goat yogurt as starter because it gave the best flavor by far of all the other store brands we found. I contacted them directly to learn about this source. This one package goes for $8.50 Canadian + shipping. This entry was posted in Food & good eating. Bookmark the permalink.